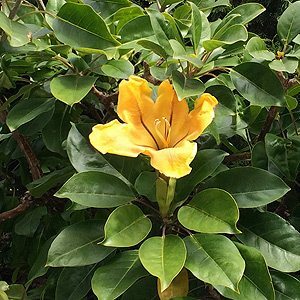 Solandra maxima is also known as the Cup of Gold Vine and Golden Chalice Vine. A vine that is grown for its large golden yellow flowers which appear from late winter through to summer. Although Solandra maxima is originally from Central and South America, it does grow well in cooler climates. In warmer areas it will be evergreen, in cooler climates it will be deciduous, or partly deciduous. In Australia it will grow well at least as far south as Melbourne. Beside the wonderful flowers the glossy foliage is an added attraction and also a wonder foil for the yellow flowers. The flowers and foliage of this vine are poisonous, so use gloves when handling. This is a large evergreen woody climber in warmer climates. Decidous and smaller growing in cooler areas. However this is a plant that is easily pruned to keep it shape and at the right size for smaller gardens. Best grown in a humus rich soil with some moisture, the main requirements are some general purpose fertilizer in spring and some extra water in dry summers. Mulch around the root system to maintain moisture. You will also need to provide some support, consider growing along a fence where it will easily cover 8m. As it flowers on new growth, Solandra maxima is an easy plant to prune without doing much damage. You can simply prune to shape each year after flowering. Or if the plant becomes to untidy, you can prune back hard in early winter.